Abstract: Anastasia Egorova was a one-legged Russian tramp whose wanderings took her all over the Soviet Union in the 1920s-1940s. At the end of the Second World War, she decided to see the world, and successfully crossed the Western border in 1945, claiming to be Polish. Travelling on to Italy, she found refuge in a psychiatric hospital and stayed there for four years, until Soviet officials looking for repatriation prospects came by and offered her free passage home. She accepted, and was duly repatriated and returned to her native village in 1950. The paper examines this microhistory from the Soviet archives. Bio: Sheila Fitzpatrick is primarily a historian of modern Russia, especially the Stalin period, but has recently added a transnational dimension with her research on displaced persons (DPs) after the Second World War. She received a Mellon Foundation Distinguished Achievement Award in 2002 and the American Historical Association’s Award for Scholarly Distinction in 2012. She is past President of the Association for Slavic, East European and Eurasian Studies (formerly AAASS) and a member of the Australian Academy of the Humanities and the American Academy of Arts and Sciences. Having worked for most of her career in the United States, she moved back to Australia in 2012. As a historian of twentieth-century Russia, her earlier work focused mainly on Soviet social and cultural history in the Stalin period, particularly social mobility, social identity and everyday practice. Using some of the techniques of her “everyday” work, she recently published her first major study in political history: On Stalin’s Team: The Years of Living Dangerously in Soviet Politics, which came out with Princeton University Press in 2015. My Father’s Daughter, her memoir of her father, the radical historian Brian Fitzpatrick, and her childhood in Melbourne came out in 2010, and she published a memoir of life as a student in Cold War Moscow in the 1960s, A Spy in the Archives in 2012. She is currently co-CI (with Mark Edele) of an ARC-funded project entitled “War, Displacement and Resettlement” as well as working on a more personal DP study based on the correspondence of her late husband, the physicist Michael Danos, and his mother Olga when they were displaced persons in postwar Germany. 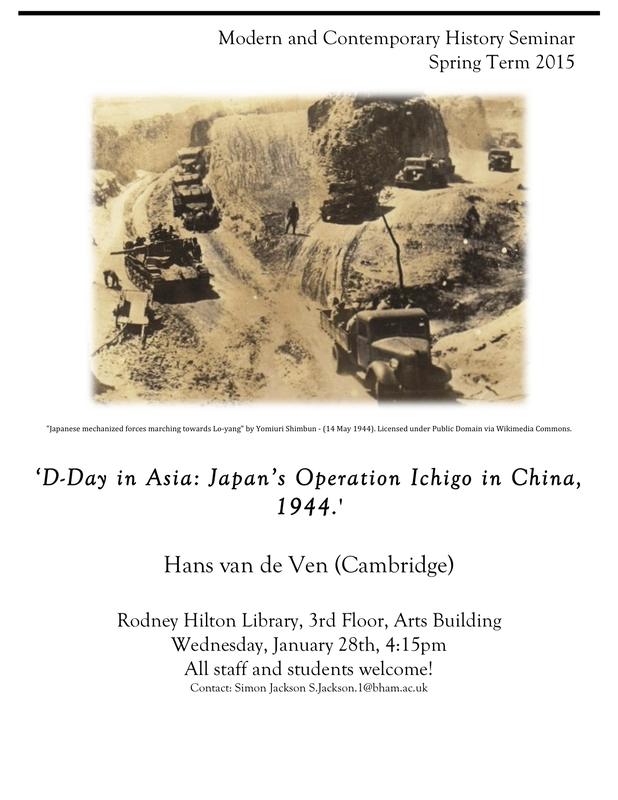 Spring 2015 Week 3 Seminar: Hans van de Ven: D-Day in Asia: Japan’s Operation Ichigo in China, 1944. Abstract: If D-Day was the defining event of 1944 in the European Theater of the War, Operation Ichigo, the largest ground operation of Japan during WWII, was so in East Asia. Unlike D-Day, Ichigo was a disaster for the Allies and a triumph for Japan. During this presentation, Hans van de Ven will analyze the reasons for the poor performance of Chinese Nationalist troops, its consequences for the rise of the Chinese Communists, and the long term impact on the history of East Asia. He will also discuss how individuals experienced the war and how intellectuals responded to it. All are welcome, and there will be drinks.